So the worst happens and you're involved in an accident or get sick in Hanoi. Advice is usually to get out of Vietnam and over to Bangkok or Singapore, but that’s not always possible or necessary: assuming you’ve got cash or insurance, adequate medical treatment may be available in Hanoi. There are three main Westernised places in town. 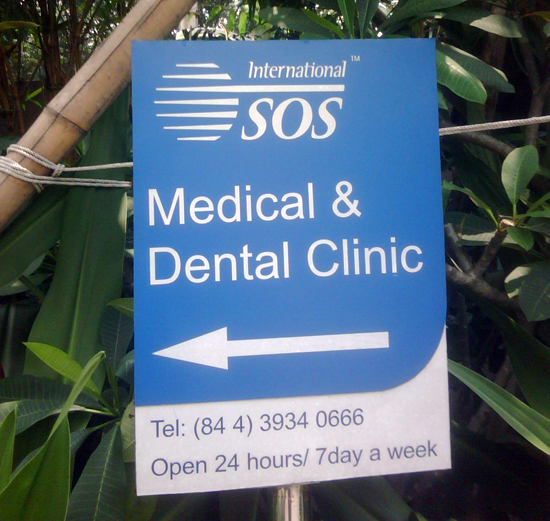 Firstly, International SOS Clinic. This is, as the name would suggest, an international operation with other branches in HCMC. I’ve been to the centre — though not for treatment — and it was clean and bright. In terms of looks, it would not be out of place in any city around the world. There's never an emergency proof-reader around when you need one. However, according to expats who have used the clinic, it’s overpriced and often incompetent. It is, however, open 24/7 and is still going to be a good sight better than the local options. It also has an emergency call number. Family Medical Practice gets better reviewed. Still expensive but not as pricey as SOS, it provides better quality care and a range of services, including outpatient and inpatient care, paediatrics and medical evacuations. 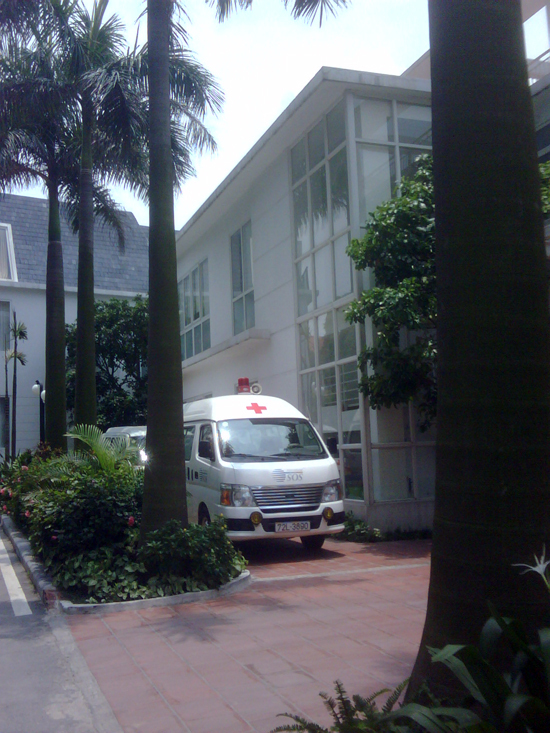 It also has an emergency number, provides an ambulance service and has clinics in HCMC and Danang as well. Outpatient clinic times can be seen here. Nice and shiny, but not too good in traffic. Finally, there’s the French Hospital, a “68-bed multi-disciplinary care facility offering essential medical and surgical services”. Of the three places I’ve mentioned, it’s the only one to state prices on its website: you’re looking at US$50 for a general consultation, which is cheaper than the other two. Reviews are mixed. They also have a 24/7 emergency service. If you really can’t stretch to the prices these places offer, then you have two options: you go to a local hospital or self-medicate via a pharmacist. My friends live next to Dong Da Hospital and thought it was derelict until they saw people in medical uniforms walking around and realised that it was in fact a fully functioning hospital. My point? Avoid local hospitals if at all possible. That said, a local hospital does seem to get better reviews than all of the places I’ve mentioned above. Hong Ngoc Hospital is based in Ba Dinh district, and although very few of the staff speak English, prices are reasonable, it’s clean and service is good. Definitely worth a look if you’re feeling well enough to negotiate around the hospital itself — the reception desk is upstairs — and can speak Vietnamese, feel confident with your sign language or have a Vietnamese friend. It would be my first choice if I was in need. As for self-medicating: it’s a lot easier here than back at home, in terms of the drugs that are available without prescription. 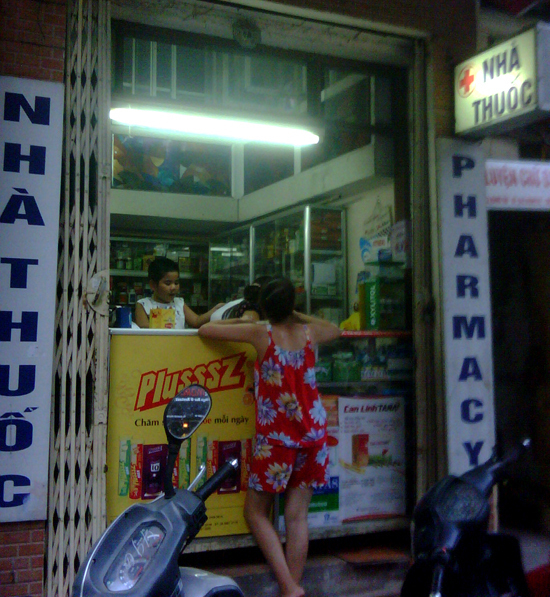 We saved a heap of cash by researching an ailment online and buying some antibiotics at a pharmacy (look out for “Nha Thuoc”) rather than going to FMP. But be careful: the drugs may be counterfeit, so treat with some caution. Pharmacies are also handy if you just need some antiseptic and bandages to patch up a wound — at least the Panadol seems to be real enough.